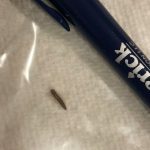 We recently heard from a reader who discovered little white worms on her counter top. She has never seen them before, and isn’t sure what they are. She explained that her husband’s cat has been getting into the house recently, so she wonders if they might be related to the cat – either coming from its body, or from the cat bringing them inside. 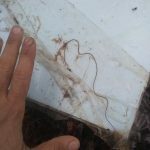 The photograph shows 4 creatures with tan, segmented bodies. They have darker heads and 3 pairs of prolegs. We think these specimens are probably mealworms. Mealworms are extremely common household pests. 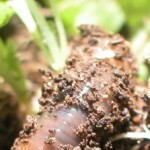 Even though the word “worm” is in their name, they aren’t actually worms! 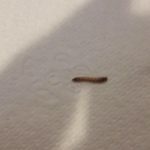 They are the larval form of the mealworm beetle. 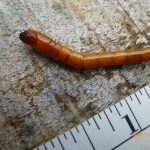 While some people use mealworms as reptile food or for waste disposal purposes, these larvae are generally considered to be pests since they feed on stored grains. Despite being pests, getting rid of mealworms typically boils down to cleaning up and removing whatever food source they are enjoying, and doesn’t often require the use of pesticides or calling in an exterminator. So, to get rid of these creatures our reader will just need to give her kitchen a thorough cleaning! Since mealworms eat stored grains, our reader should start her investigation for the food source in the pantry. She should sift through all her pantry items and look for signs of mealworms. We recommend that she throw away anything that looks suspicious. In addition to going through her pantry, our reader should clean out and wipe down all cabinets and countertops. This will help get rid of any other small particles these specimens are feeding on. Once all the food sources have been eliminated, our reader should do one final cleaning of her kitchen, making sure to sweep, vacuum, mop, scrub, and wipe down everything. There are also a few things our reader can do to prevent future visits from mealworms and other household pests. She can check to make sure that all of her doors, windows, and vents are properly sealed and don’t have any small gaps in them where mealworms could sneak through. Also, she can buy pantry goods in smaller qualities and store them in airtight containers, or store them in her fridge or freezer. Our last suggestion is that our reader clean her whole house in case any remaining mealworms sneak off to other rooms in search of food once the kitchen is cleaned. To conclude, we believe the white worms our reader found on her counter are mealworms. 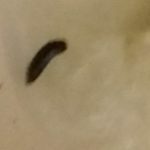 We don’t think these larvae are related to her husband’s cat, but if she is worried about the health of the cat we encourage her to bring it to the vet! 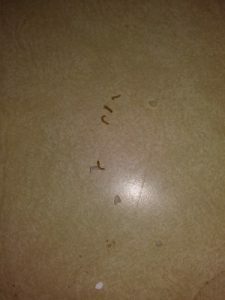 We believe the white worms our reader found on her counter are mealworms. 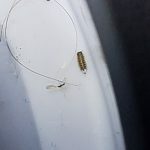 We don't think these larvae are related to her husband's cat, but if she is worried about the health of the cat we encourage her to bring it to the vet!